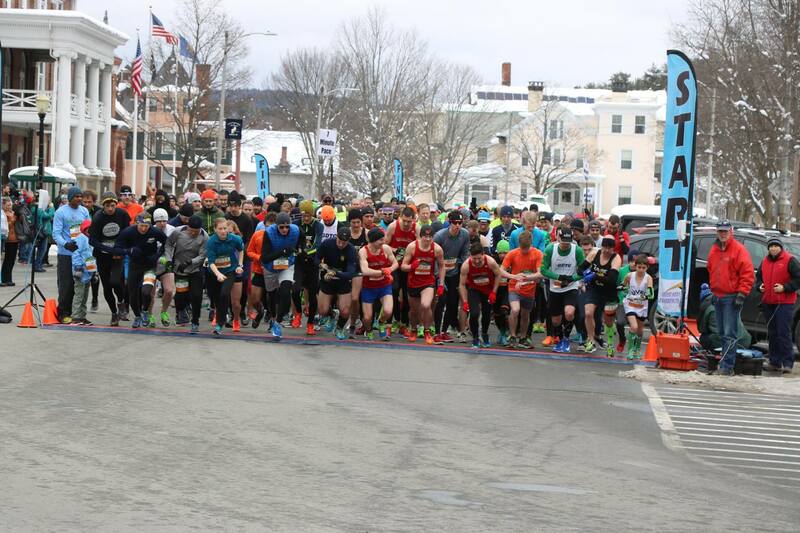 The 17th edition of the Lebanon Parks & Rec Shamrock Shuffle served as the first race in this year’s NH Grand Prix. 924 finishers were treated to a rolling 5k, free Bratwurst, and a fun-filled St. Paddy’s day celebration. Crossing the line first was defending male 29 & under champion Jake Wormald, who’s 16 minute, 16 second performance bested the course record set by Josh Fontaine in 2015 by four seconds. * Teammate Brandyn Naro (16’49) and Upper Valley’s Kevin Hartstein (17’08) placed 2nd and 3rd. UVRC newcomer Bess Ritter took top honors for the women, posting an astounding 18 minute, 55 second time. Ritter finished almost a minute up on her closest competition, UVRC teammate Mary Peters (19’50). The Upper Valley women would sweep the podium, capped off by Megan Miller‘s 3rd place finish in 20’03. The top age-graded performers on the day were UVRC’s Rich Smith and Betsy Gonnerman. 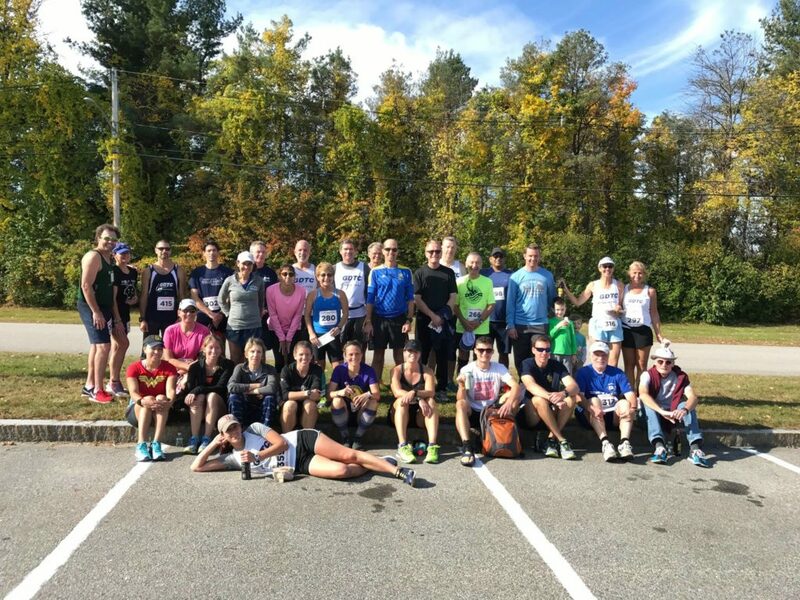 The Upper Valley Running Club utilized their home road advantage well, jumping out to an early lead in the team standings with 227 total points. The Gate City Striders were the runner up team with 163 while defending series champion Greater Derry Track Club finished 3rd with a total of 135. Visit the Schedule & Results page for a full breakdown and the official scoring spreadsheet. *Overall race record is 15’36 held by Rick Rountree. The course was changed in 2015 to ease traffic management at the start. Both the old and new course are USATF-certified. The 2018 series has been announced! With the conclusion of the Granite 10 Miler, the Greater Derry Track Club has officially captured the 2017 Grand Prix Team Title. The Gate City Striders were the top club the 10 Miler, but GDTC was able to hold onto their lead and win the series. What a great battle between those top two teams all year long! Congrats to everyone on a fantastic year of racing. We hope you enjoyed this year’s slate. Stay tuned for more details regarding individual/age group awards and Granite Runner prizes. The Greater Derry Track Club gathered their forces and executed a big late season team performance to close the gap and take command of the series. Collectively, the GDTC scored 222 team points to best rival team Gate City’s 167 total by 55 points. That is enough to open up a 33 point series lead going into the final event. Individually, UNH standout Kevin Greene and Cornell alum Corey Dowe raced to the individual titles in 15’13 and 18’05 respectively. The series finale is the Granite State 10 Miler in Concord on October 22. It’s going to be an exciting finish! 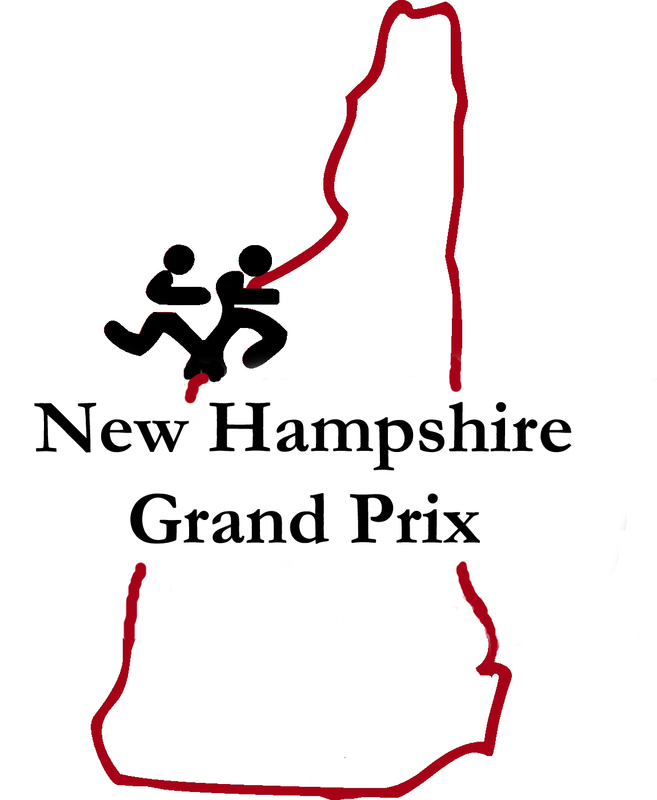 The 2017 NH Grand Prix took a trip to the northwestern part of the state last Sunday as NH club members competed in the Canaan Police Run From the Law. Crisp conditions and a flat course lead to some solid summer 5k times as Steve Hammar (GCS) and Lorna Young (UVRC) took the overall titles in 15’54 and 18’01 respectively. On the team side of things, it was the Upper Valley Running Club who defended their home turf, scoring 186 points for the win. The Greater Derry Track Club rolled up 2nd with 160 while series-leading Gate City finished a close third, racking up 157 team points. Rob Edson (UVRC) and Pam Moore (UVRC) won the age-graded titles on the day. 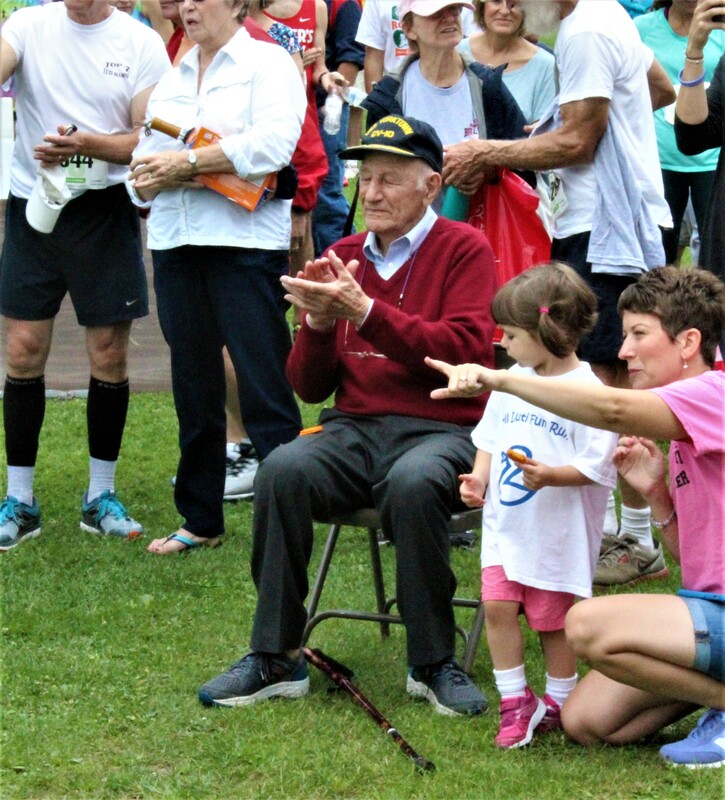 Next in line is the St. Charles Children’s Home 5k in Portsmouth on Labor Day morning, Sept. 4th. Cool conditions made for a stellar day of racing in Concord for the 50th Annual Bill Luti 5 Miler. Individually, AIC alum Glarius Rop and New England Distance ace Rachel Schilkowsky took home the wins in 25’34 and 27’56 respectively. Rachel’s time bested Heidi Westover’s course record by 25 seconds. On the team side of things, Greater Derry won with a total score of 173, shrinking Gate City’s series lead down to 25 points. Next on the schedule is the Canaan Police Run from the Law 5k on August 6th. See you all in the Upper Valley! With the conclusion of the Gate City Half Marathon, the 4th event in this year’s series, the Gate City Striders hoist a 55 point lead over 2nd place Greater Derry Track Club. The Upper Valley Running Club sits in a distant 3rd at the halfway point with 417 points. Individually, Derrick Hamel (SIX03) and Lindsay Close (GCS) took home the overall titles while Gini Nichols (GDTC) and Charlie Bemis (GDTC) were the top age-graded performers on the day. Congrats to all who came out to the Seacoast to support Chief Michael Maloney and all area first responders. On the individual side, Jake Wormald (GCS) and Emily Cousens (MILL) lead their respective races gun to wire for the win. On the team side, it was a tight race between the top three teams in the league. Charlie Bemis (GDTC) and Gini Nichols (also GDTC) take top honors in the age-graded category. The 2nd race in the 2017 NH Grand Prix took place last Sunday with the Red’s Race for a Better Community. 667 finishers crowded the streets of Dover with 190 of those finishers representing NH Grand Prix clubs. The top two overall finishers from the first series race would repeat as the 1, 2 at Red’s, but in reverse order. It was Gate City’s Steve Hammar who bested the field with his time of 26’16 while GCS (and high school) teammate Jake Wormald finished 2nd in 26’45. Mary Peters of the Upper Valley Running Club crossed the line first for the women in a speedy 31’28 with 51 year old Lisa Miller traveling from Pacific Grove, CA to grab the silver medal in 31’56. On the team side of things, the Greater Derry Track Club prevailed over the Gate City Striders by a slight margin, accumulating a total of 152 point on the day. Gate City’s 142 was enough to hold their staple on the series lead so far. Upper Valley placed 3rd with 122 points for the race and a total of 213 over the first two races while hometown club Six03 Endurance posted their largest series presence so far, placing 4th with 114 points. On a frigid cold day in Nashua, NH, the Gate City Striders made an appearance at the Team Earley Leprechaun Leap took command of the NHGP Series early on. The striders won the team competition 203 to 165 over 2nd place Greater Derry Track Club. The defending champions Upper Valley Running Club placed a distant 3rd with 91 team points. 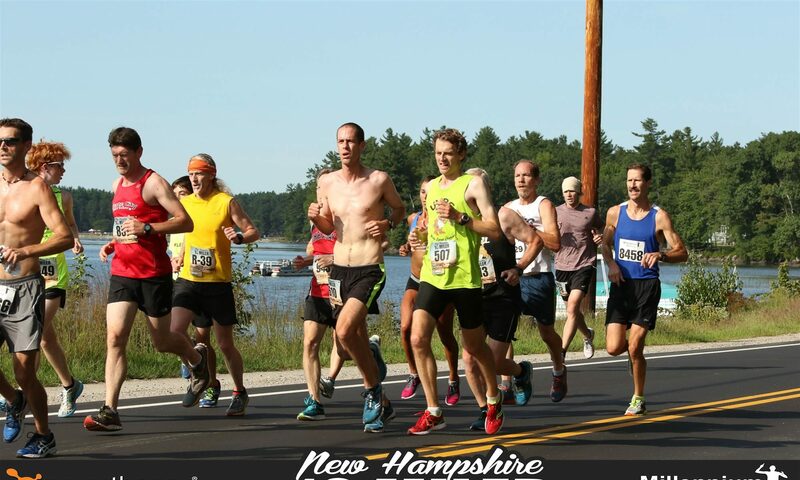 Individually, it was SNHU XC alumni Jake Wormald and Souhegan’s Shannon Earley (both repping Gate City) who took the overall titles in 16’25 and 20’05 respectively. Gini Nichols (GDTC) and Rob Edson (UVRC) were the top age-graded performers on the day. Next race on the schedule is the Red’s Shoe Barn 5 Miler on April 9th in Dover. See you there!